All along, I’ve been having trouble with the filament feed on my CupCake extruder. Regardless of how closely I position the idler wheel to the drive pulley, the slightest blockage at the extrusion nozzle (even sometimes removing the text extrusion with needlenose if I get too close) causes the timing pulley to ream out a pulley-sized divot from the soft ABS. 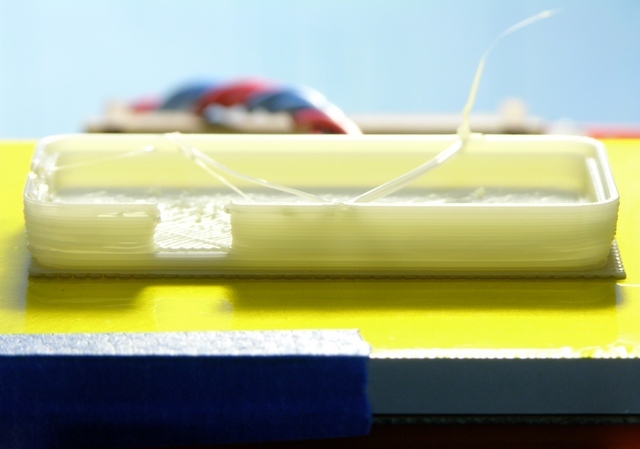 There’s then no way for the extruder to move the filament — forward or backward — until I get pliers and apply considerable force to the filament at the intake to move the divot past the pulley. nophead isn’t the first to use this technique to manufacture a threaded pulley and I’m not the first to copy his notion of using it on a RepRap, but I’ve lost my links to many of those who have done it before. At any rate, I installed one on my CupCake this weekend and the results are considerably beyond my expectations. Here’s the story. What LED Currents Should I Offer? The MAX16823 that my LED driver is built around uses current-sense resistors to set the LED strings current to .203V / R.
So for the maximum 100mA, R = 2.03Ω; for 20mA, R = 10.15Ω. I’ve laid out the board to accommodate both SMT and through-hole sense resistors. I’d like to offer boards preassembled for at least 100mA and 20mA and boards without sense resistors so you can provide your own resistors for custom currents. Should I offer other preconfigured currents besides 100mA and 20mA? Do I need to bother with 15mA? Let me know in the comments what currents you’d like to have. Just because you ask for something doesn’t mean I’ll provide it; but if enough ask for the same thing, I very well might. The long-languishing linear LED lighter is back in my “get it done” pool. I have the parts sourced, the design refined, and a big bag of utterly failed attempts to print an acceptable case for it on my CupCake. Fine. Forget the case. No case. The project, to refresh your memory, is a linear driver for three strings of LEDs, up to 40V and 100mA per string. You supply your own power (5-40VDC), LEDs, and wire. After spending two hours looking through 250 pages of connectors in the Digi-Key online catalog (I am not kidding), I’m distressed to discover that the least expensive connectors I can find are going to cost about $2 per board. Feh! But I want the power and LED connectors to be polarized, and that’s more expensive than plain ol’ .1″ headers. Here’s a mockup (clickable for the big pic, like all the photos here) of an early prototype PCB with product photos of the connectors I’m leaning toward. On the right, a six-pin header for three LED strings and a representative two-pin plug that’s polarized by virtue of the semi-latching bump. On the left, a two-pin header for power and definitely-latching matching plug. Note that the male connectors are on the board to reduce the opportunity for shorting what’s on the ends of the wires while they’re unplugged and flailing around. Is it reasonable to expect people to plug three two-pin connectors into the right places in a six-pin header? Is it worth making the power connector different from the LED connectors, to make it harder to misconnect things? How many people are going to crimp pins onto the wrong wires and have to start over? Opinions in the comments, please. If you think you can find me less-expensive polarized connectors with .1″ spacing (I want to offer the driver with straight male headers for breadboard friendliness) that I can buy from a supplier as reputable as Digi-Key, please provide direct links to at least the header and ideally the plug and crimp pins. Free LED driver if you actually come up with something I like better. The connectors I show above come to about $2 total per board, not $2 each. That’s still a larger fraction of the electronics cost than I’m happy about. I’m trying to make it as small as possible (A) on principle, (B) to save on board manufacturing cost, and (C) to make it easy to “hide” the driver within whatever you’re building. I have a little more optimization to do; but you can see that the board size will very soon be determined by the size of the connectors. Because of this, I would really rather not leave extra “key” pins in the LED string connector — they’d widen the board. (Arguably I could then shorten it, but I’m not convinced I could really make that happen, given the distance I need to fan traces out from the TSSOP. The TQFN pinout doesn’t make things significantly better, either.) 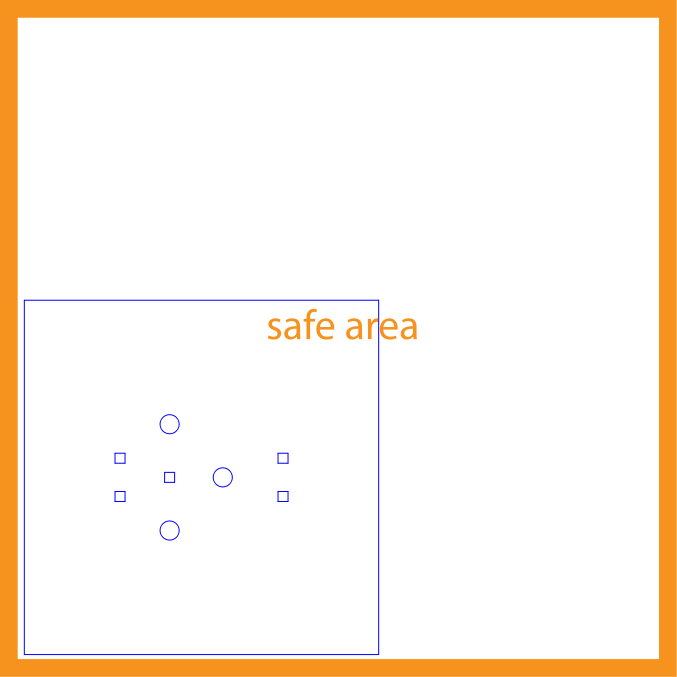 I’d also rather not use connectors with “walls” between the two-pin pieces, as they’d increase the PCB width (height?) by at least .2″. Also if I go with the six-pin connector idea, the female headers need to have thin outer walls so they can fit side-by-side between adjacent pins. By my read of the MAX16823 datasheet, if you misplug an LED string one pin off, it simply won’t light, nondestructive to both the LED and the string. I assume you would then look at the plug and see you had misplugged it and replug it correctly — so this should not be a catastrophic event. 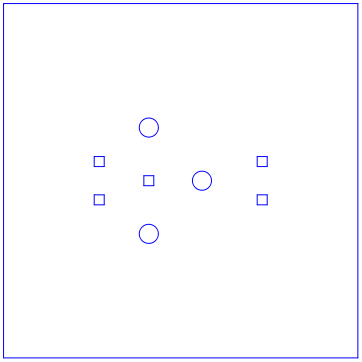 I also intend to indicate the correct divisions of the 6-pin connector in silkscreen. I know people will still get it wrong occasionally, but since it won’t hurt anything — good enough? Asmodeus has found the connectors I want to use and pointed out the (obvious) way to space them to meet my board criteria. If I need further input, I’ll mock up another picture with the latest plan and start a new post. Thanks to you all, and comments are now closed! 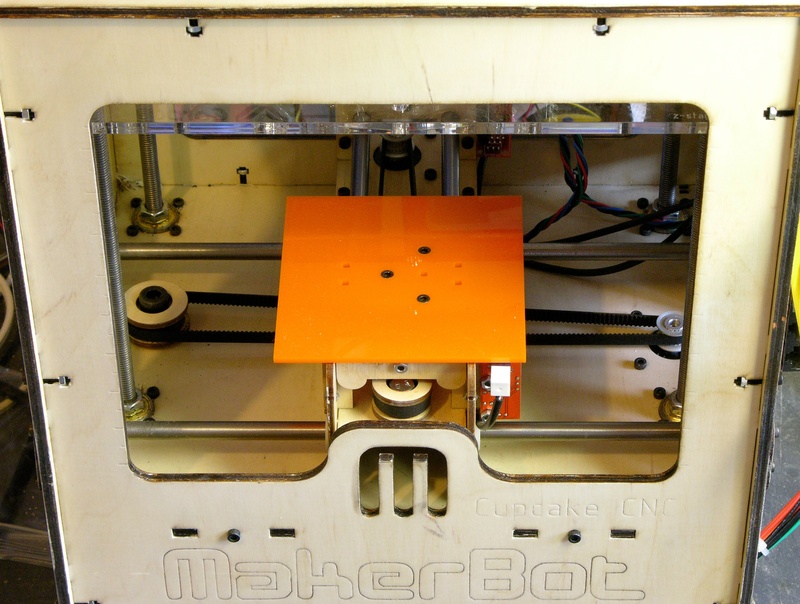 Thanks to nophead’s discovery that kapton tape makes a perfect ABS extrusion build surface, I knew that I wanted to cover my heated MakerBot CupCake build platform with it. While Scott was milling me a plate, I ordered a roll of 4″ kapton tape and a roll of 1″ double-stick kapton tape from eBay seller mn-vac, whom I can’t recommend highly enough. He had some long-running auctions that he had updated to indicate that he was out of town and wouldn’t be able to ship for a couple of weeks, but still responded immediately to my questions and had the package shipped to me well before he was even scheduled to return. I had my acrylic insulator from Ponoko that press-fits perfectly onto the Y stage and the aluminum plate from Scott. 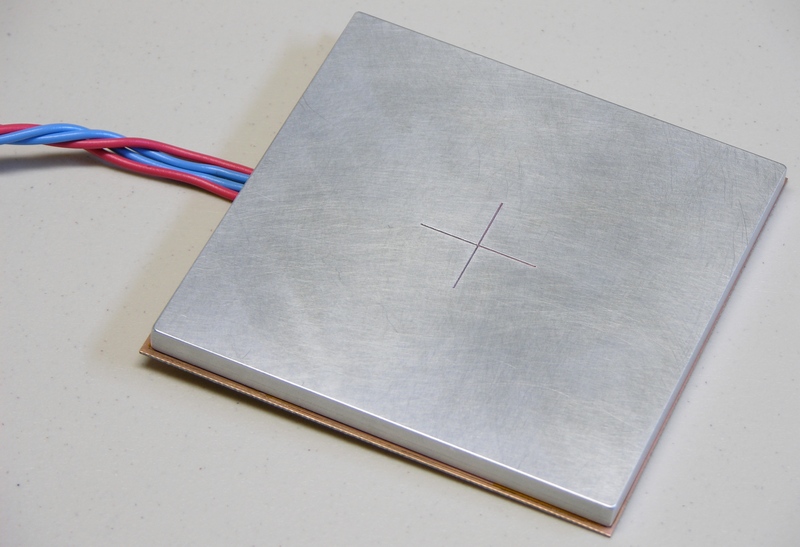 Scott had even milled a recess into the underside of the plate for the SMT thermistor Tom put onto the heater PC board; but because I wasn’t sure exactly what other features would need recesses and where, Scott left them for us to mill. Two weeks ago Tom and I finally got together to assemble the heater, aluminum plate, and insulator into a tasty heater sandwich. First I marked on the aluminum the location where the wires would connect to the PCB. Tom milled a recess into the aluminum to provide clearance for the solder joints on the top side of the PCB. 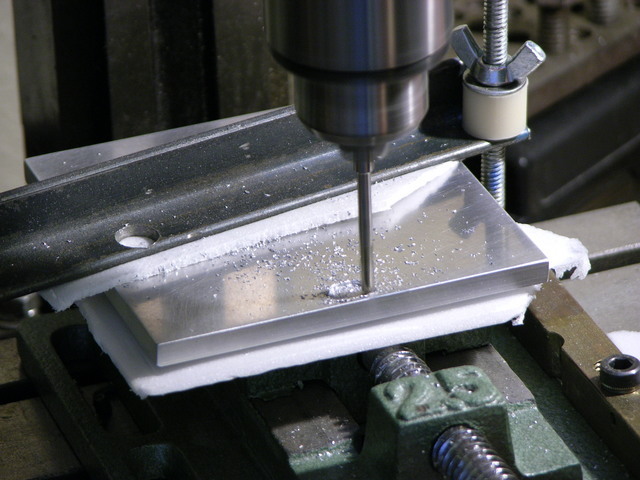 Tom did quite a nice job of milling a trapezoidal recess by hand without any CNC assistance, and was careful to protect the surfaces of my milled plate. Tom soldered wires to the heater PCB. After confirming that the heater resistance was still about 4Ω at the far end of the leads (the same as the resistance of the heater trace on the board) to make sure we hadn’t shorted anything, we covered the PCB with double-stick kapton tape. 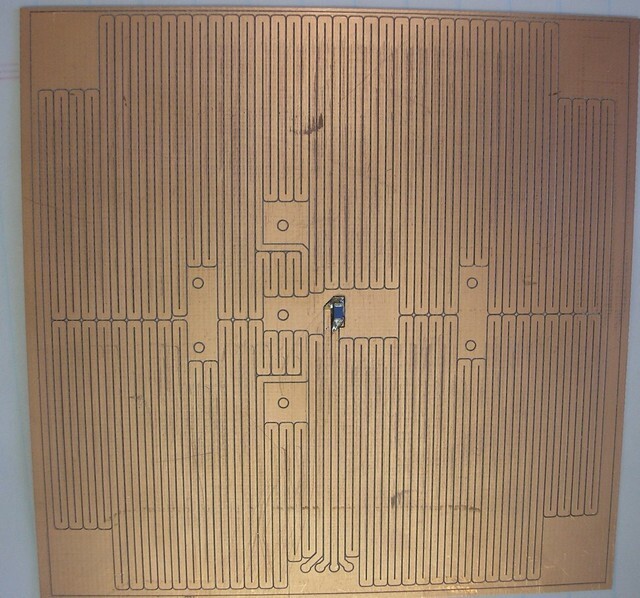 The PCB was slightly oversized, so I had fit the pieces together first to mark the correct alignment. 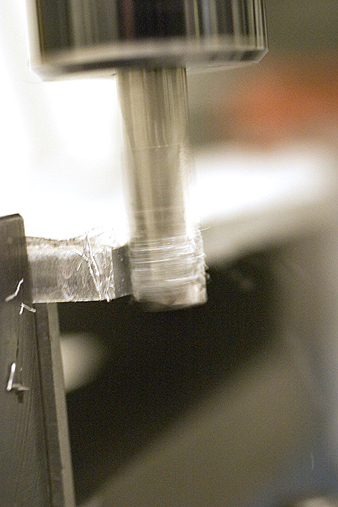 I set one edge of the aluminum into place on the double-stick tape, leaned it down and rechecked alignment against my marks, then pressed it into place. 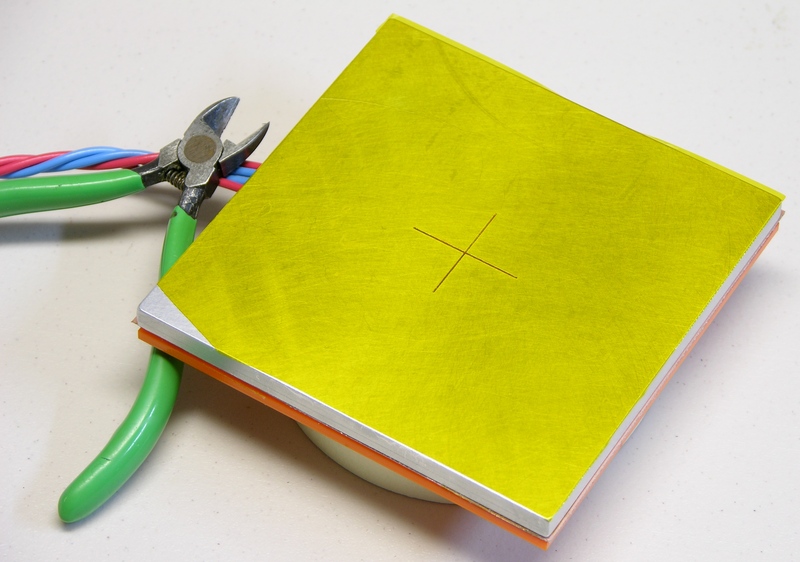 Besides holding the pieces together, the tape insulates the PCB traces and the thermistor from shorting on the aluminum. We re-measured the heater resistance at 4Ω just to be sure we hadn’t shorted anywhere. 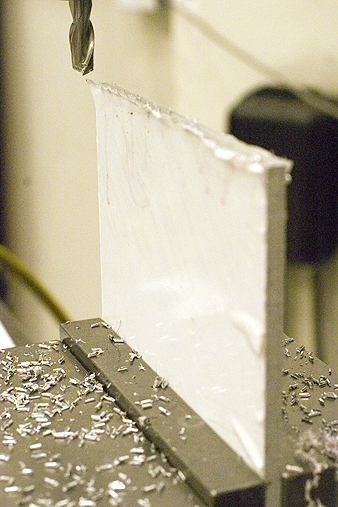 While Tom was milling the aluminum, I had marked, cut, and filed a notch in the acrylic to route the wires out the back of the heater assembly. 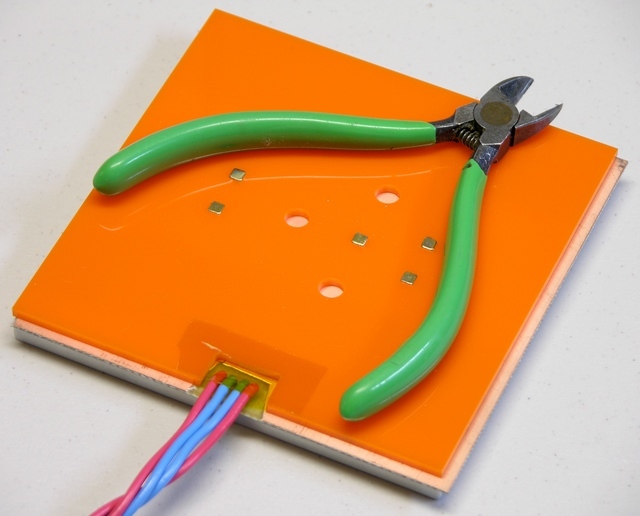 We attached the acrylic to the sandwich in similar fashion and put a little piece of kapton over the wire recess, more for show than because it actually provides much holding power. I could fill the recess with a heat-safe gasket compound, but the wires have been doing okay so far and I like knowing I can disassemble this for repair or upgrade. Note how Tom peeled the copper off the back side of the PCB around the wires’ through-holes. Oh, and it didn’t help that the aluminum was still hot from a test firing and Tom and I were both halfway juggling it trying to hold it and the tape. Many folks building heated build platforms are powering them from the extruder and hacking the firmware to control the platform temperature. I’m not averse to this idea in the long run; but for expedience, I brought a variable power supply and we used it to power the new heater. Tom ran the supply up to about 24V to heat the platform quickly and then dropped it back to 12V to maintain a fairly steady temperature somewhere in the 180-200°F range. (It wasn’t varying that much; I just don’t remember exactly where Tom set it.) The power supply’s current meter showed a reassuring V / 4Ω the whole time. 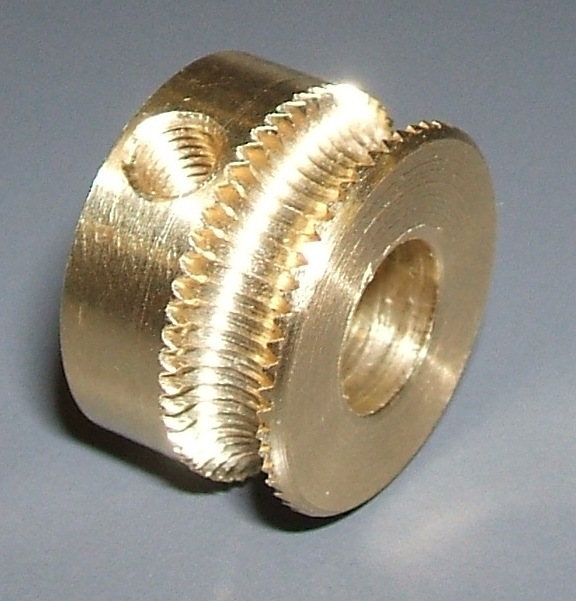 The first printing attempt was Zach’s idler pulley. I have other settings wrong (the perimeter density is too low), but the raft adhered perfectly to the kapton. The lifted corner is where I started to peel up the still-pliable ABS without having let the platform cool quite enough. Tom added the blue tape, by the way, to create a non-specular surface for the IR thermometer we were using. Skeinforge had some wacky ideas and my densities were off again, but a fob case built perfectly flat with no lifting or warping as well. I let the fob cool longer than I had the pulley before trying to remove it, and it popped right off the kapton with only slight deformation in the corner where I wedged the knife blade (still too soon). As nophead did on his initial tests, I got delightfully smooth and reflective surfaces where the ABS conformed to the hot kapton. As zaggo described in Living in Times of Warp-Free Printing, I no longer need to print a raft under my builds. I’ve not yet installed the Skeinforge Raftless module, which prints a leader into the first layer to give you time to fine-tune the nozzle height (and amount of extrusion squish) and slows down the feed rate of the first layer to help smoosh it onto the platform. But with judicious live Z-axis tweaking, I’m getting reasonably good results. 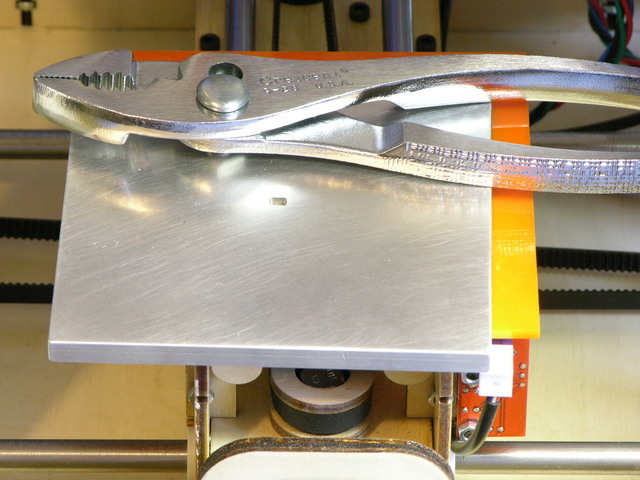 The aluminum plate appears to be dead flat, as it should be (and as I had hoped). 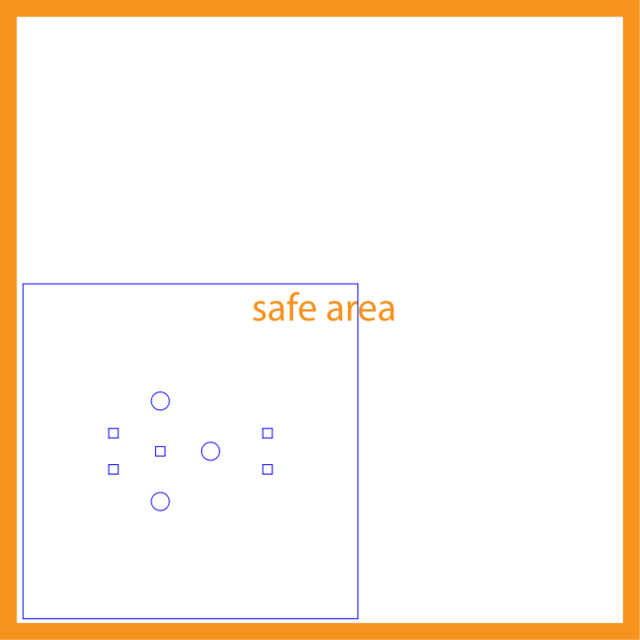 It is not, however, dead level with (parallel to) the X and Y axes, causing the first layer of large objects to be tightly smooshed at one edge and not quite sticking to the platform at the other edge. Tom and I stacked copper tape scraps on the underside of the platform in a quick and dirty attempt to level it, but the copper tape appears to be just squishy enough that it probably won’t provide reliable leveling. Also the left edge of the Y stage plywood is not fastened down to the walls, so there’s more play in the height / level of the left edge there. I’ll probably glue that together to make it rigid enough to use as a good base. I had assumed I’d use the thermistor for closed-loop feedback, but at Tom’s house 12V seemed like the perfect supply to keep the plate at the desired temperature and I considered wiring it straight to the PC power supply. Since then I’ve used it in my colder utility room and had to turn the supply higher than 12V to get the plate warm enough. That suggests both that I will need to use the thermistor and that the CupCake’s PC power supply may not be an adequate power source for this heater. We may need to make a second PCB heater with slightly lower resistance — although I’m leery of increasing the heater current too much, lest the lead wires start heating up too. Alternatively, rather than cranking up the power, I’m considering making plexiglass doors or panels to cover the CupCake’s openings and retain more of the heat from the platform. It seems like a more efficient approach; and it would also help warm the whole chamber, which should further reduce warping on objects that are both tall and wide. Even though the extruder pokes through the top of the CupCake when at its highest elevation, quite a bit of the CupCake top could still be enclosed — and the Z platform itself nearly spans the CupCake interior, helping trap heat in the part of the chamber containing the heated platform and the extruded model. Again a good thing. Looking back at my notes, I see I got parts 2 and 3 out of sequence; I actually sent off to have an acrylic insulating plate manufactured before Scott milled me the aluminum bed. No matter; I didn’t receive the package of insulators until well after Scott had sent the aluminum. After Tom offered and built me the McWire PCB heater, I was thinking about how best to attach it to the CupCake’s Y stage. The Y stage has M3 machine screw heads poking out the top, which are actually nice for maintaining registration of the build platform; and it has five magnets embedded in it to keep the platform securely attached to the stage. Although Tom left clearance in the heater PCB for all of these things, I wasn’t sure I really wanted to have to drill through the PCB and into the aluminum plate to fit the PCB/plate sandwich onto the Y stage. I also didn’t think I really wanted to put a heater directly onto the Y stage. Even at temperatures not intended to melt the extruded plastic but only to keep it warm, I wasn’t sure whether the heater would scorch the wood, cause it to warp, or do something else undesirable. While puzzling over how to attach magnets to the heated build platform, it occurred to me that I should simply do what MakerBot did in the first place — press-fit the magnets into lasercut holes. And the rest was obvious. Ponoko is an online service billing itself as “the world’s easiest making system.” You upload drawings in your choice of a couple of different vector formats, select materials, and confirm what you want done. They laser-cut your drawings and ship you the results. Rambling sidebar: By the way, I interpret the CupCake’s CAD files’ CC-GPL license as indicating that I may legally copy the CAD files and make derivative works. CC-GPL refers throughout to programs and it’s not clear how it applies to designs for physical objects; but also it takes effect not when you modify but when you distribute modified works. The original MakerBot build platform does not contain a copy of the GPL as it would be required to were it a program being distributed under the GPL, thus I don’t think that my insulators need to contain a copy of the GPL even if I distribute them, as they would if they were programs. However, I want to be true to the spirit of the license attached by the creators; and if this works out, I’m glad to make available the SVG files I created and used. 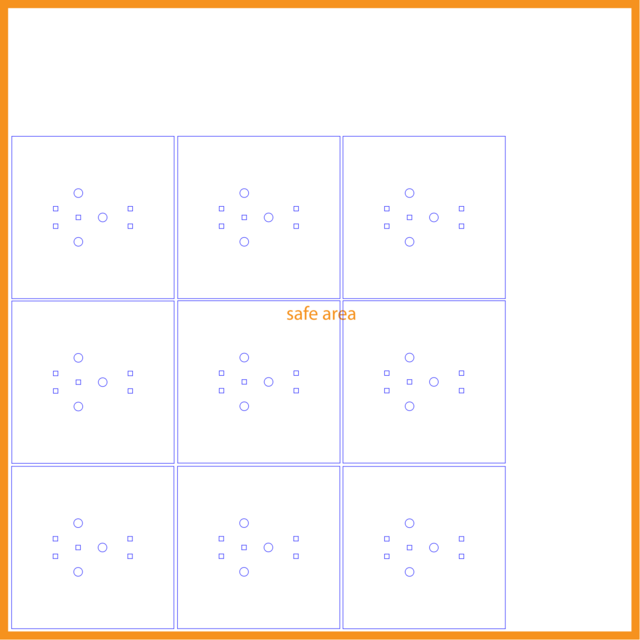 I loaded Ponoko’s “P1″-sized template into Inkscape, imported the modified platform SVG I had saved from QCAD, changed its line color and width to the settings Ponoko uses to indicate cutting (versus etching), and saved a copy. I uploaded it to Ponoko, selected 3mm acrylic as the material, and ran through a shipping quote — which due to an incorrect default setting on my Ponoko account was going to make the part in New Zealand and ship it to me at a cost of about $80. While I was straightening that out, I loaded a “P2″ template and placed nine insulators on it. (Although I left more space between copies than I needed, there was definitely not enough room to get four copies along either edge.) I got my “manufacturing country” set correctly and ran an estimate on the 3×3 P2 version. P1 $.83 $2.50 $5? $8.33? 1 $8.33? I don’t think I reran shipping on the exact P1 shown above, but I had run another P1 and got shipping in the $5 range. So I could get one insulator for ~$8 or nine for $26.27 ($2.92 each). I submitted my P2 order for nine insulators. 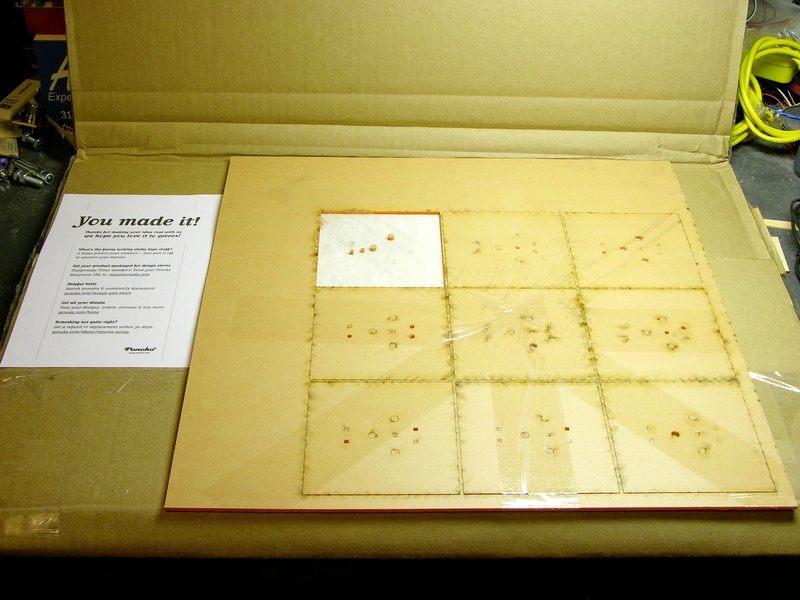 I was shocked to see an estimated delivery time of four weeks — it didn’t seem like it should take that long to slip a sheet of plastic into a laser cutter, run my design, and throw it in the mail. But I think Ponoko is doing well and has a lot of business, so it makes sense that they’d have a backlog. Ponoko sent me updates as my order was being validated, prepared, cut, and packaged. It shipped two weeks after I uploaded my file and arrived about a week after that. Opening the package was a bit anticlimactic — the protective paper on both sides of the plastic is rather boring to look at and visually disappears into the shipping cardboard. But I had lovely orange parts inside! 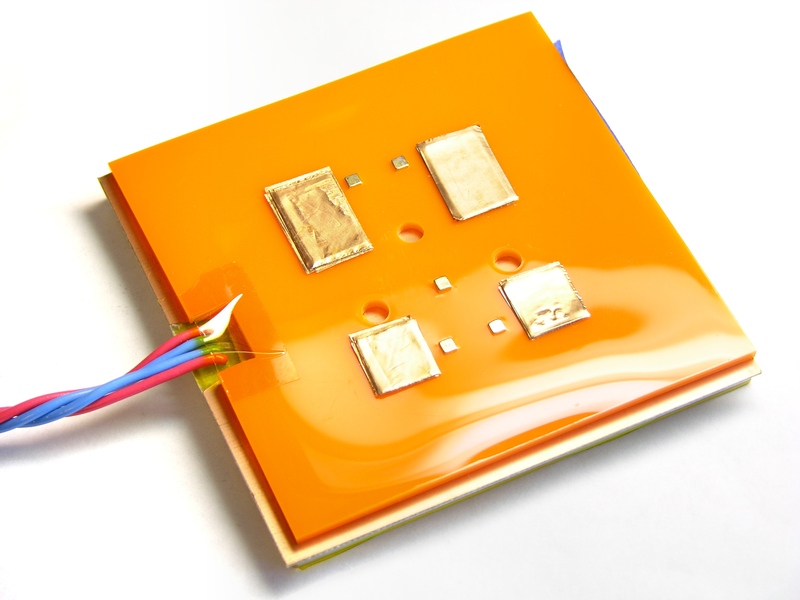 I had originally thought that the kapton tape I intended to use on top of the aluminum plate would look oranger than it ended up, so I had tried to find an orange translucent acrylic to match it, but it was out of stock. I picked the orange opaque, which I find rather striking, and probably like better than the yellow translucent I would have picked had I had my tape on hand already. The acrylic insulator press-fits perfectly onto the machine screw heads — it feels like I wouldn’t even need the magnets to hold it in place! 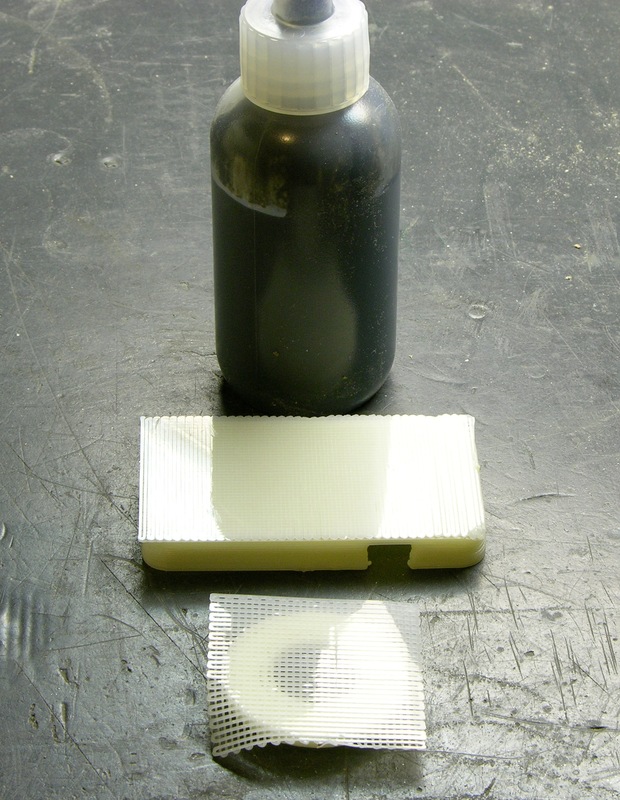 On January 5, nophead wrote of his serendipitous discovery that ABS sticks well to hot kapton tape and releases well from warm kapton tape. Coupled with difficulties I’d been experiencing with my plexi build platform not being rigid and flat enough, I knew immediately that I wanted the top of my heated build bed to be aluminum plate covered in kapton. 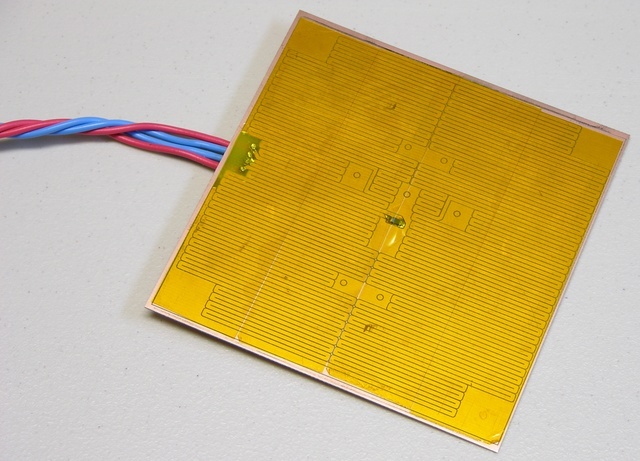 When Tom McGuire built me a PCB heating element, he offered me some sheet aluminum for the top; but although not thin, it wasn’t thick enough to be as rigid as I wanted it to be. I contacted my friend Scott Smith who has taken up machining and he offered to mill me a piece from some 1/4″ plate he had on hand. I sent dimensions and he did the rest, including taking pictures and sending me the following commentary. 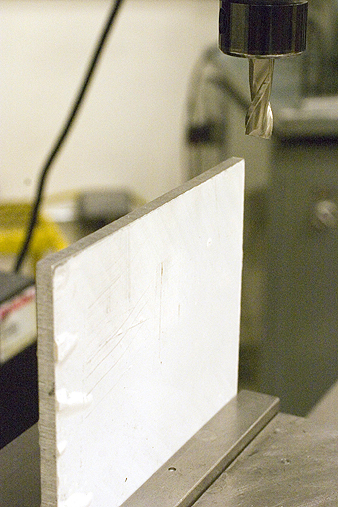 Having rough-cut a 100mm square piece of polished flat 0.25″ aluminum on the band saw, it’s time to square off the edges. After one edge is flat, I can flip the piece over and mill the opposite side. Once done, I have at least two sides that are guaranteed parallel. 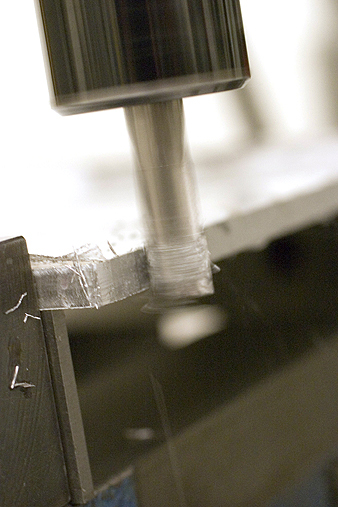 When I rough-cut the piece, I left some extra so that I could square the piece off without losing too much material. Now both sides are parallel. Next, I lay the piece flat in the vise with the non-parallel edges on the left and right sides. I can run the mill in the Y direction to square these last two edges off. 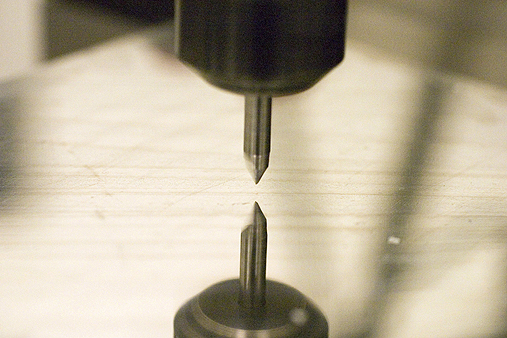 Once the piece is square, I use an edge finder to zero out the CNC at the center. 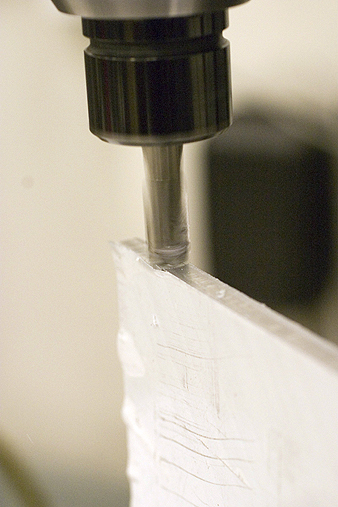 The stop is placed in the vice so that when I flip the piece over, I don’t have to re-center the CNC again. 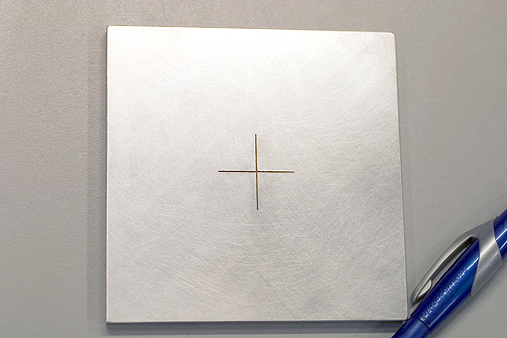 The crosshair is made using an 60 degree engraving bit at high speed. 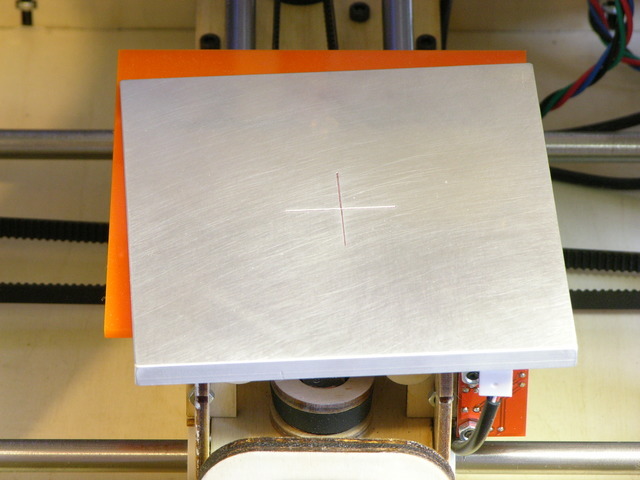 To zero out the Z axis, I wiggle a piece of paper back and forth under the engraving bit as I slowly lower the spindle. When the paper stops moving freely, I set the Z position to the thickness of the paper. After engraving there were burrs around the crosshairs. Before I use Scotch Brite to clean it up, I take a red sharpie and ink in the grooves. 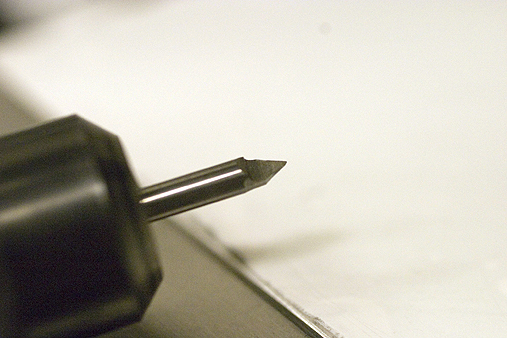 The Scotch Brite takes any excess ink off of the surface, but leave the ink in the grooves. Hard to see in this photo, but the crosshair is red. Over the holiday break, I had written about using a hairdryer to heat my CupCake build chamber. Hey Keith, I haven’t caught up with your blog for some time. Looks like you got a lot done in the last couple weeks. It’s good to see you’re getting results from your CupCake. Can I help you with a hot plate? 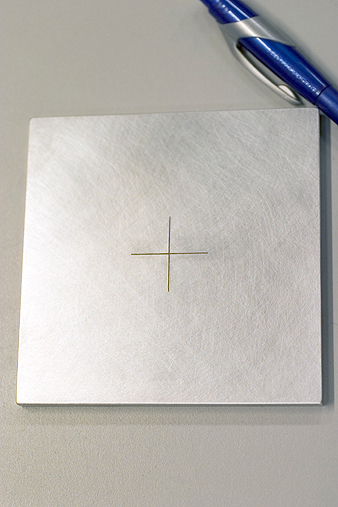 I could make you a thin aluminum plate about 4″ square that gets up to 200°C. I guess you would need it to be insulated on the bottom to keep from burning your stage. 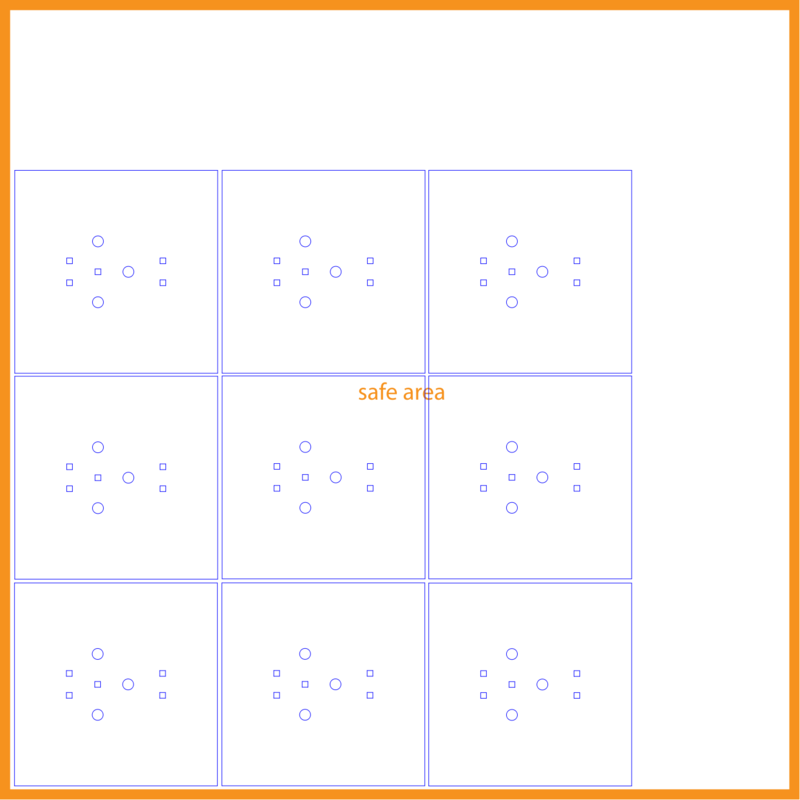 Do you have a low voltage with lots of current available, say 12V @ 10A or may be 5V @ 20A. What do you think? What did I think??? I thought it sounded great! The heated chamber was helping my prints, but I was still getting some warp. I knew a heated platform was the way to go and it had been my goal all along. Oh 100°C would be no problem for PC board material. I was thinking at first to place a bunch of low ohm surface mount resistors around on a 4″ square PC board but then I remember we did this other project that was supposed to be in inductive coil for an induction heating system. It turned out to be more of a heater coil itself. I could do something like this but in a square pattern and leave openings for your screws and magnets. Because I wasn’t sure yet whether the heater PCB would mount fairly directly to the Y stage (and thus need holes for screws and magnets) or be raised above it (far enough that it wouldn’t need holes), I pointed Tom at the CupCake CAD files on Thingiverse. 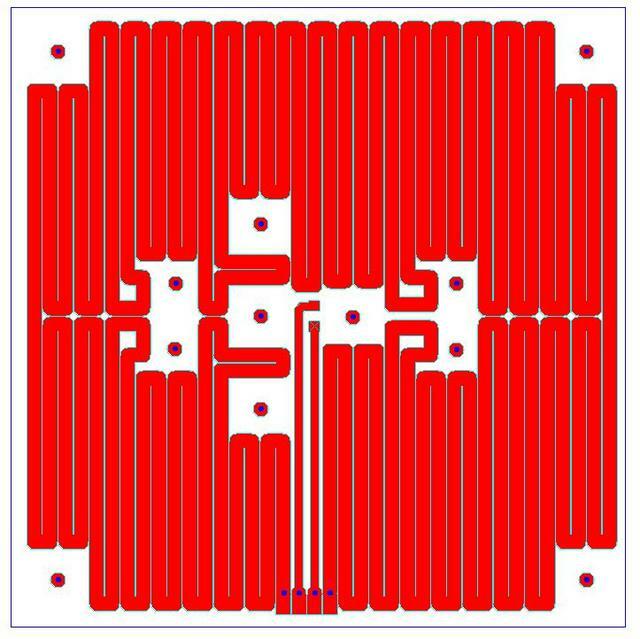 He downloaded the DXF for the original build platform to get the hole size and spacing, then laid out this heater PCB with traces fitting around all the necessary openings. Then he showed up for lunch with a milled heater PCB that ended up measuring 4Ω resistance (an extremely convenient value) and with an SMT thermistor already soldered in the middle. 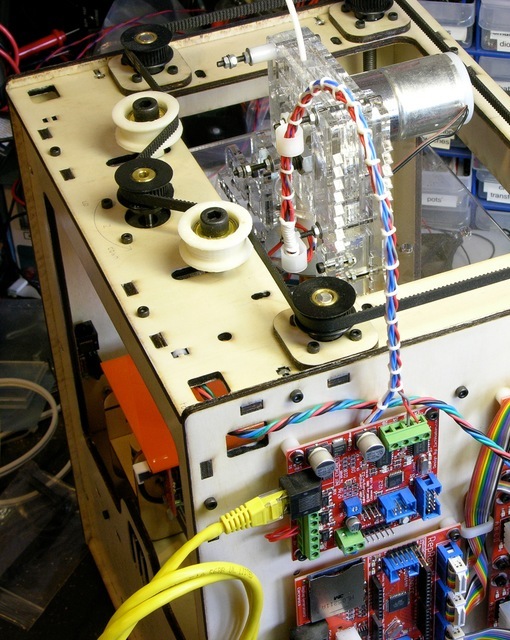 I’ve been dissatisfied with having the CupCake’s extruder controller attached to the front of the extruder. 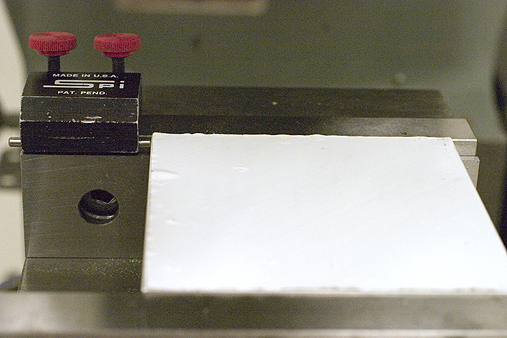 The PC board (being opaque) blocked the view of the feed mechanism. As much trouble as I have with filament feed, it’s pretty important for me to be able to keep an eye on it. Actually, as many times as I’ve had to disassemble the feeder (replace broken idler pulley, reglue idler pulley, remove broken feed pulley flange, replace broken plastic?, etc. ), I also got tired of having to remove the PCB every time. I’d previously mounted the extruder PCB up on the highest two screws of the extruder housing, placing it above the feeder face instead of covering it, but that was pretty fragile and I was constantly worrying about bumping it and snapping it off. This weekend I moved the extruder controller to its new permanent home on the right side of the CupCake in the empty space above the motherboard. 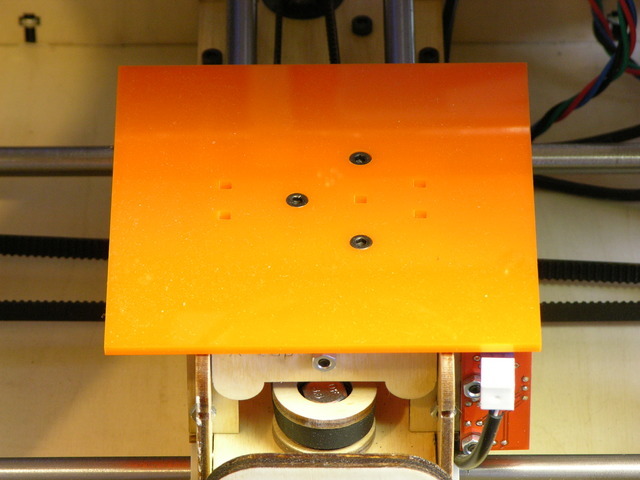 It fits nicely and shares a mounting screw with the upper Z-axis endstop. It does block access to the SD card slot, but I don’t use SD cards anyway. Even if I do someday, I think I’m most likely to put a card in it once and leave it there for doing prints without a host computer connected. Now that I’ve eliminated printing stalls and blobs, I don’t have a lot of reason to try uploading designs to a card every time before printing, nor save designs to a card from the host to then install into the machine. When I have time, I’ll make a shorter (4″?) patch cord to jumper from the motherboard to the extruder controller without all the excess I currently have coiled up. I also got to try my hand at cable lacing, something I’ve long admired in old TVs and vacuum tube organs. 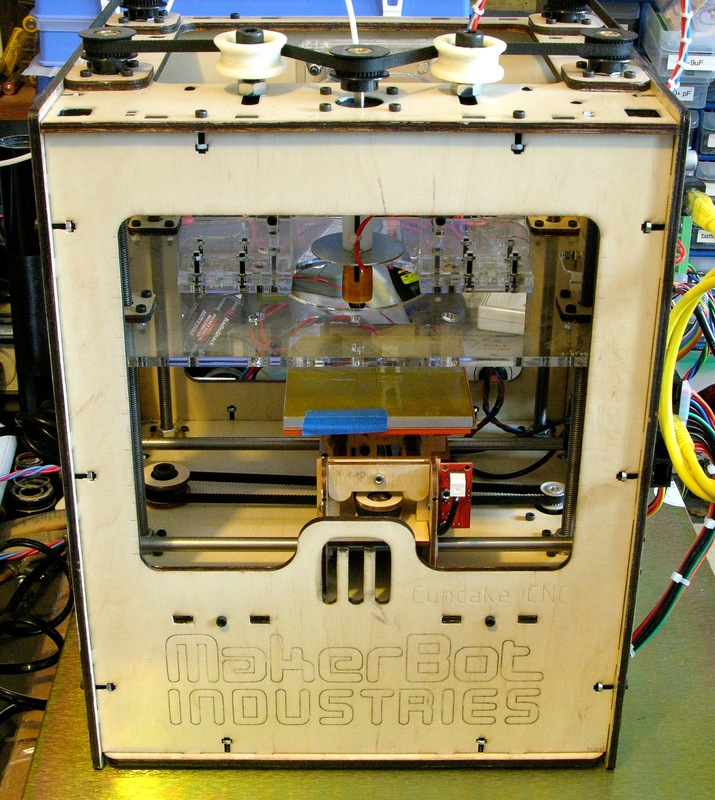 I don’t know that it’s the right look for a modern rapid prototyping machine, but the waxed string cost only a pittance and it doesn’t have to be the permanent solution. The cable clips I had on hand were too big to anchor the mobile end to the extruder properly, but they do help guide the cable until I can buy smaller clips. Initially I had thought I’d need to enclose a piano wire in the cable bundle to help it maintain its arch, but it’s flexing very nicely without additional support. 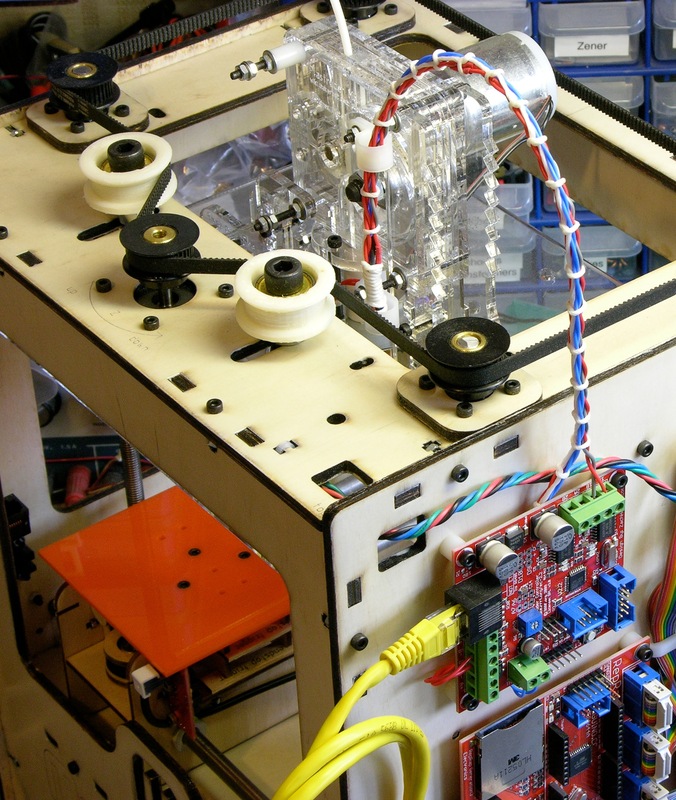 I’ve been concerned about the ability to deliver enough power to the extruder controller over the ethernet patch cord, especially when people are running heated build platforms off it too. I realized after the fact that I should have checked the wire gauge I was using before extending the heater wires out the top of the machine, but let’s check it now. Powerstream.com provides a wire gauge and current table and calculator. For the 24-gauge wire I used, they list the maximum amps for chassis wiring as 3.5A, which is a comfortable margin over my actual current of 12V / 6Ω = 2A, so I’m safe. Toward the bottom of the page they have a load calculator. 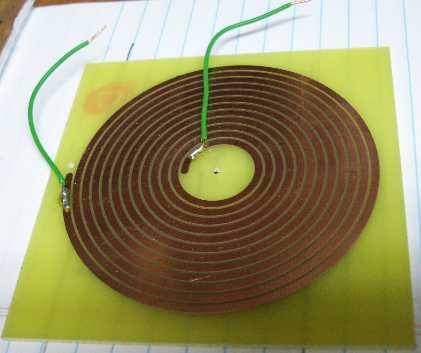 Entering 24-gauge copper, 12VDC, 1.5′ one-way length, and 2A, they show a round trip .158V (1.32%) drop in the wire and 11.842V delivered to the nichrome heater. Not too bad. While we’re here anyway, let’s do the math for running both the nozzle and platform heaters from the extrusion controller in its original configuration. The interface uses three wires of the (almost certainly) 24-gauge patch cord for each of 12V and GND, so that’s equivalent to just over a single 20-gauge wire. The nozzle heater was 2A and I see people talking about 4-6Ω platform resistance for another approximately 3A. The chart says 20 gauge is good for 11A for chassis wiring, which is a comfortable margin. The calculator shows a .314V drop over the 3′ patch cord, still delivering 11.7V to the extruder controller. Quite acceptable and nowhere near as bad as I feared. When you cut up an extension cord for speaker cable (I’m no golden-eared audiophile; I just need some copper to get a few hundred watts from place to place), save the ends to reassemble into mini extension cords. They’re perfect for plugging wall warts into receps and power strips without making adjacent receps unusable too. I’ve spliced a lot of different kinds of cables — sometimes repairs for friends, sometimes Frankensteining things together for a project — and I’ve always been dissatisfied with the aesthetics when I’m done. Covering the joint in heatshrink hides the ugly splices from direct view, but the heatshrink tapers where it falls off the edge of the cable’s jackets and has unsightly bumps covering the solder joints. This weekend I tried out a couple of ideas for achieving a smoother splice. The basic method was sound; and although the results aren’t yet what I hope to accomplish, I think they’re leading in the right direction. My first idea was based on a woodworking scarf joint — a fancy term for cutting ends on a diagonal to make a joint less visible. I sliced each jacket lengthwise about an inch and a half from the cut end, then attempted to cut the peeled jackets into smooth diagonals. I tied the jacket pieces out of the way with velcro, preloaded the wires with heatshrink to cover the splices, and soldered the individual wires together. 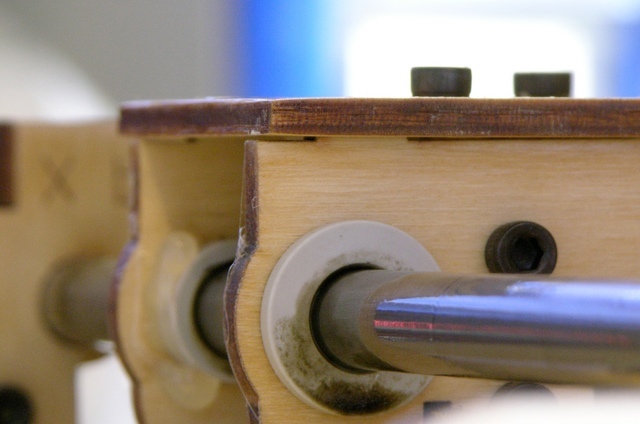 Note that the individual joints are all offset so that even if the heatshrink were to fail or be abraded, the exposed joints still couldn’t come into contact and short out. It turns out that eyeballing the mating jacket shapes before putting the cable back together is a bad idea (or at least that I’m not very good at it). I left a fair bit of gap, uh, everywhere — if I were to try it again, I’d wait to cut the scarf (scarves?) until the reassembly stage, at which point I could do a better job of mating them. Note that the way the jackets flare out where they come from the unaltered cables into the joint is due to heat while heatshrinking the individual wires, not due to the bulk of the splice area. The result is arguably smoother than my previous methods; but because the lumps don’t logically derive from the splices inside, I actually find it more aesthetically displeasing. On the second cord I spliced, I slit the left jacket but didn’t shape the split end and I cut the right jacket completely off the cable. After soldering and heatshrinking the wires, I wrapped the left jacket back around the joint, covering it pretty cleanly. The gap where the two ends’ jackets meet is quite evident, but this shows that rewrapping the wires in the cables’ own jacket is a considerable improvement over just heatshrinking the joint. Two short cords, ready to use with wall warts. For next time, I’m most interested in retrying the scarf joint and cutting the two jackets to mate after finishing splice. I think it offers a good chance of minimizing the gap at the end of each jacket, and I think the long diagonal gap under the heatshrink could be nearly invisible with a little care. Obligatory cautions: Electricity is dangerous. Splicing cords is a bad idea. Don’t burn your house down. Make sure extension cords are unplugged before soldering. Do not taunt mini extension cords. 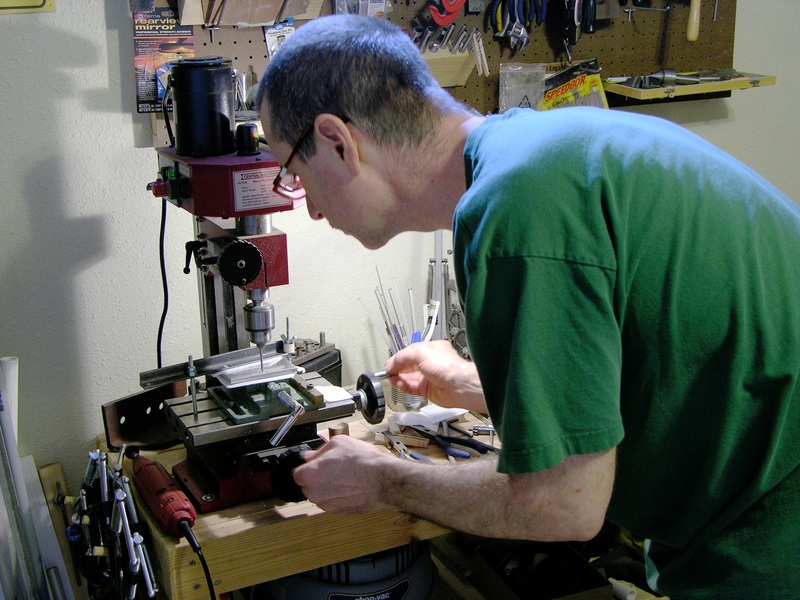 You are currently browsing the Keith's Electronics Blog blog archives for March, 2010.